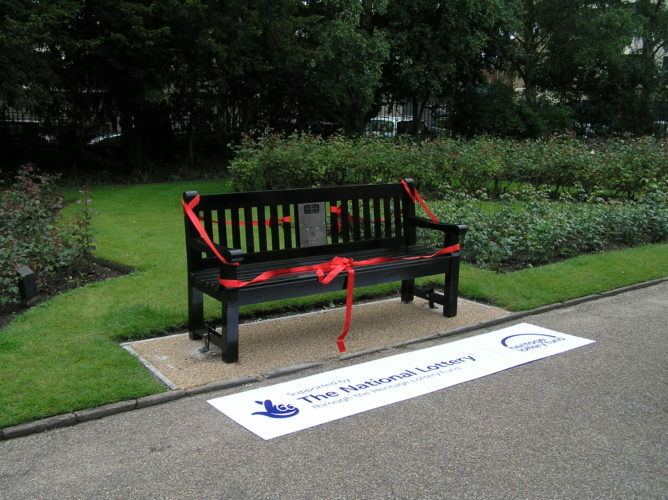 Welcome to the information page for the listening bench installed in Colchester, Essex. Here you can find out more about the clips featured on the bench. There is also information about Colchester Recalled, who made the original recordings and put the clips together. The clips currently loaded onto the bench relate to Colchester Castle and Castle Park, which has been a popular leisure space in Colchester for over a hundred years. The left-hand button plays memories of the Castle itself, including reminiscences of the 1930s, when it was still a roofless ruin. The right-hand button plays memories of the former Colchester tradition of skipping in the Park over one large skipping rope at Easter time, and playing in the park generally. The bench is located in Castle Park, facing the Norman Castle. As you enter the park from the High Street and Museum Street, you will see the Castle straight ahead of you. Turn right and walk along the footpath to find the bench. These extracts are taken from the archive of the Colchester Recalled Oral History Group, founded in 1988. With over 3,550 hours of recordings of local people, recalling life in Colchester & District, it is one of the largest town-based archives in Britain. Now fully digitised, a complete duplicate of the archive is being supplied to the Essex Sound & Video Archive and the Albert Sloman Library at the University of Essex. Find out more about Colchester Recalled here. An introduction to the Castle from Andrew Phillips, followed by Don Scott’s memories of visiting in the 1930s, in the midst of archaeological excavations. Jacki Barber’s memories of playing in and around ‘our Castle’ – but not venturing into the dungeon! Memories of the Castle when it was a roofless ruin, and admission charges to the building (by Don Scott and Jacki Barber). Patrick Denney describes the skipping tradition; then Ethel Matthews, Albert Bridges, and Edith Moss share their memories of this annual event. Further memories of skipping in the park, from Dorothy Lawrence, Emily Tricker, and Jacki Barber. Hilda Went and Janet Graham share their memories of playing in the Park more generally.